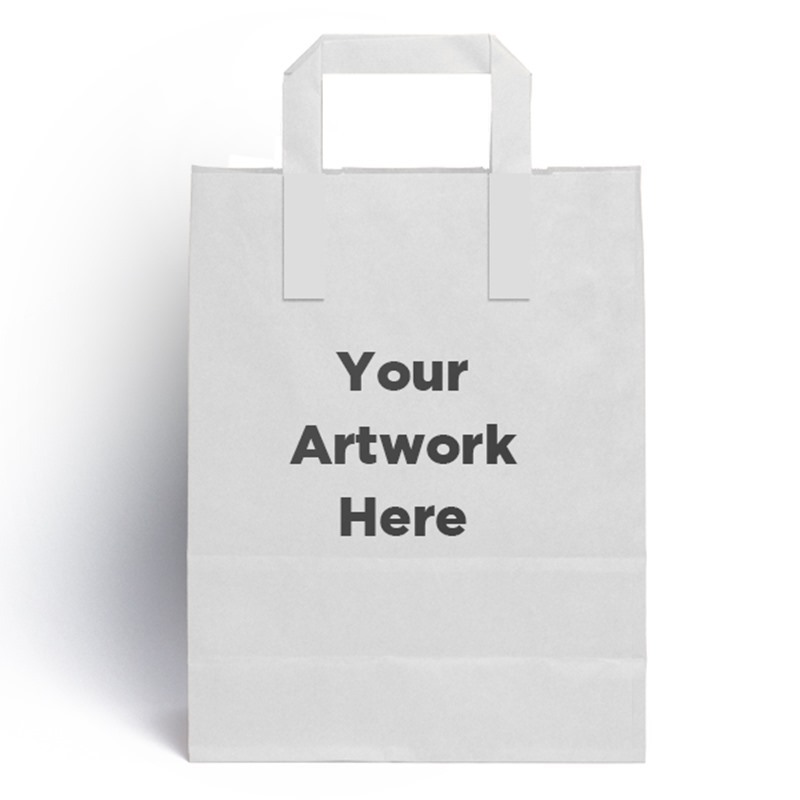 Our printed external flat handle paper carrier bags are perfect for products with a wide base. 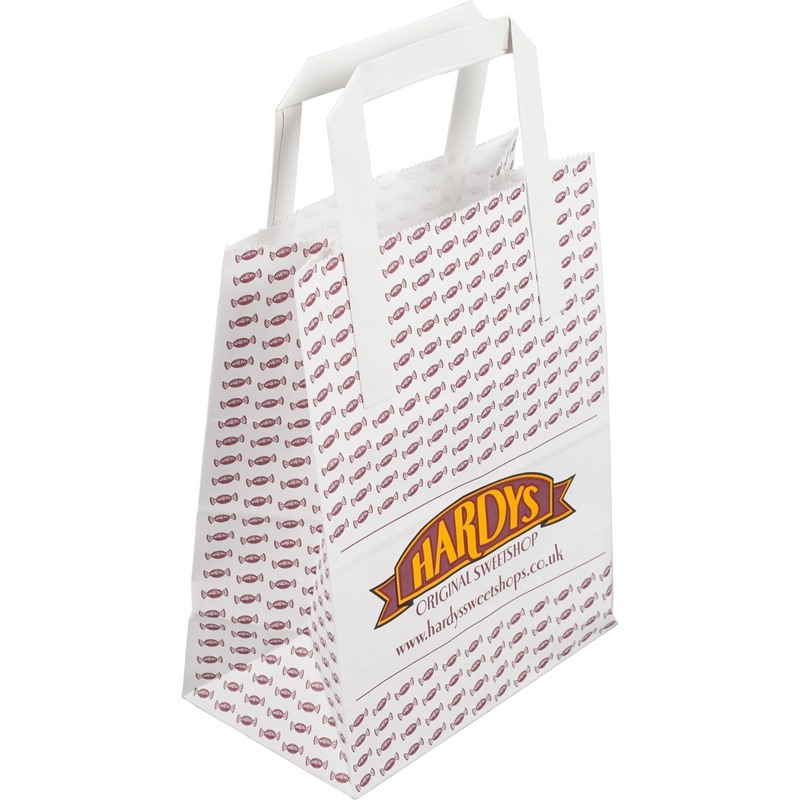 A low-cost alternative to twist handle carriers, these printed paper bags can be customised to reflect your brand personality. Our minimum order starts from only 500 bags for sinle 1 and 2 colour designs. On orders of over 5000 bags we can fully customise every option, including the colour of the handles. Our usual delivery time for bags that print in the UK is only 3 weeks. For large quantities and fully bespoke bags from Europe, the lead times are about 8 weeks. In the UK we can print in up to 6 colours (only 2 if printing on top of our stock bags). If you want something more unique, speak to one of our Packaging Consultants about the options available. Our 7 working day superfast turnaround is also available if you are in a tight spot and need your bags quickly. Not sure if it's quite right? Ideal For: Cafes, bakeries, cake manufacturers, any products that have a wide base. Flexo Overprint 2 colours maxFlexographic (flexo) printing is a form of printing thatuses a flexible printing plate to transfer the ink onto the substrate beingprinted. It is used for printing on many different types of substrate includingplastic, metallic films, cellophane and paper. The printing capability is lowerthan lithographic printing, typically achieving only 40DPI on the most basicprinters, rising to 120dpi on the most advanced. We use 2 types of flexoprinting press, a stack printer and central impression (CI) printing press. Allows printing onto pre-fabricated items so is perfect forshort print runs. It can be 1 or 2 colours in line. A conveyer belt takes theitem runs it through the print rollers. The item is then deposited into a trayfor packing. The best print results are on flat surfaces so the print areaavailable is limited by the construction of the bag. Also due to theuncontrolled nature of the printing, registration cannot be guaranteed. Themaximum tone available is 40DPI and reverse out printing is not recommended. Central Impression Press. A type of printing press used in multi-colour flexography inwhich a single large-diameter common impression cylinder supports the substrateas it contacts a series of adjacent plate cylinders, which lay down successivecolours. Central impression presses can have anywhere from two to eightprinting units, with six being the most common. The advantage of thisconfiguration is that you can print at a much faster rate than a stack presswhile maintaining much tighter registration and a higher DPI. Unfortunately they take longer to set up and so are not used on short runs.